Round reception desk in the entrance hall. The work surface in Glacier White colour of Corian® is seamlessly integrated with the natural stone. Photo: Gielissen Interiors & Exhibitions, all rights reserved. The recently renovated Rijksmuseum is one of the main attractions in Amsterdam. But anyone who comes to admire its art will surely also be captivated by the applied art created with Corian®. This versatile high-tech surface material has been spectacularly applied almost everywhere in the museum. The Rijksmuseum receives about 1.5 to 2 million visitors a year and so the Spanish architectural bureau Cruz y Ortiz chose a sustainable material. Corian® was selected for its architectural look, but also because it’s easy to clean and has a high resistance to wear. In many places, the material has been combined with fine Portuguese natural stone. Gielissen Interiors & Exhibitions was responsible for the overall project coordination and realization. 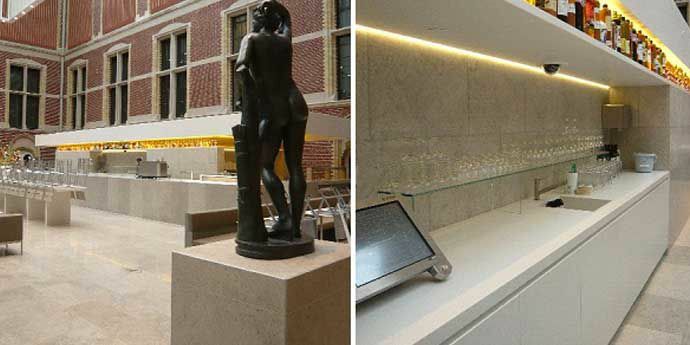 (left) On the 22 metre long bar made of Portuguese natural stone is a work surface of Corian®. The complete working area is also made from this special material in Glacier White. (right) The back wall of the restaurant is completely made of Corian® in Glacier White. Photos: Gielissen Interiors & Exhibitions, all rights reserved. 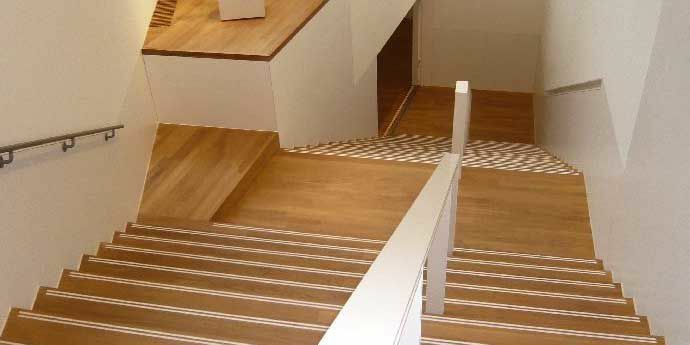 Corian® anti-slip strips have been applied to more than 900 stair treads. Photo: Gielissen Interiors & Exhibitions, all rights reserved. Corian® was used in the impressive eye-catcher in the entrance hall: the round reception desk. As the project manager points out: “This is where you can really see how well Corian® merges with the natural stone. The special sealing fits in perfectly. And the seamless curves: could it be any better?” When combined with the natural stone base, the Corian® surface almost looks like real stone. “Until you actually touch its incredibly silky soft surface,” he says. The café-restaurant uses a lot of Corian®. On the 22 metre long, Portuguese natural Stone bar, is a Corian® work surface. And behind the bar, all the surfaces are made of this special material. All the equipment is integrated, such as the electrical sockets and the used coffee bin for the espresso machine. The whole area is completely seamless, allowing all the surfaces to be cleaned efficiently. The huge back wall is also completely made from Corian®. Here Gielissen has used its incredible craftsmanship to create concealed recesses for the cooling equipment and freezers. The restaurant even contains a 16 metre long table created by Gielissen entirely out of Corian®. And all the other tables in the restaurant have surfaces made from this beautiful material in Glacier White. Invisible to the public, but still as beautiful as it is practical, is the use of Corian® in the staff restaurant. Here, the choice has also been made for sustainability and practical efficiency. The seamless application makes Corian® the logical choice for all places where people are working hard.